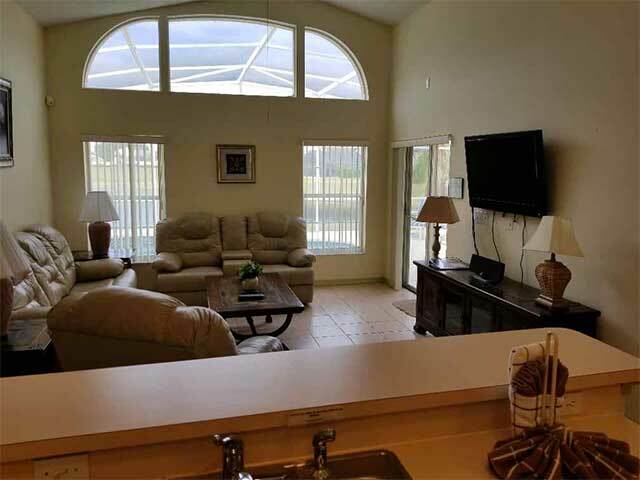 This immaculate 4 bedroom, 3 bath, family vacation villa is ideally situated only 3 miles from Disney World! 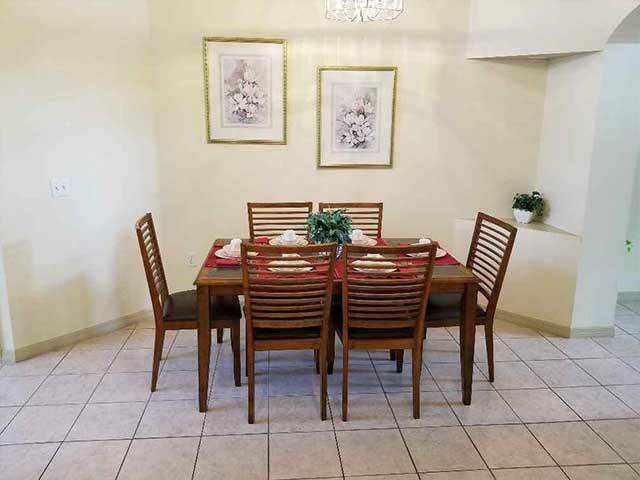 The villa overlooks a tranquil lake, a home to herons and other wildlife all year round, and from here it’s a short journey to all the major attractions in and around Orlando. 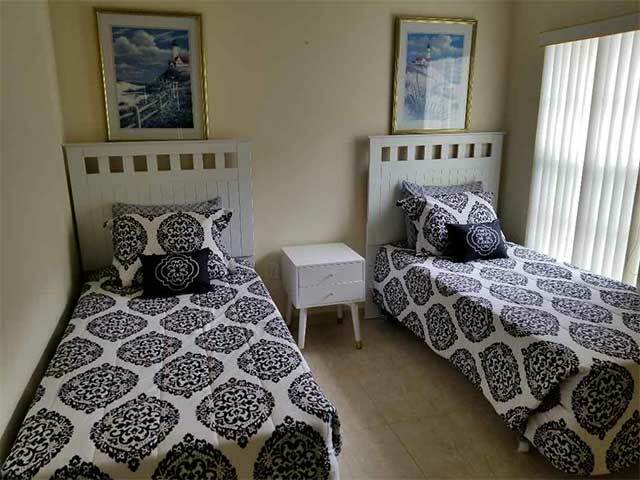 The villa’s great location makes it easy to return home in the middle of the day for a rest and a dip in the pool, before returning to the parks for fireworks and parades – something that wouldn’t be easy if you chose to rent a villa on US27, many miles away! Stay in our villa, and you’re only a mile from some great places to eat, including TGI Fridays, Outback, Red Lobster, Italian & Chinese & Japanese restaurants, and a supermarket, walk-in medical centre, ATM, and an internet cafe. Evening family fun is also close at hand (eg, Downtown Disney, Medieval Times), and the lively nightlife of downtown Orlando is a short hop along I-4 – or spend the night in, dine by the pool, then relax in the spa, or in front of the TV! 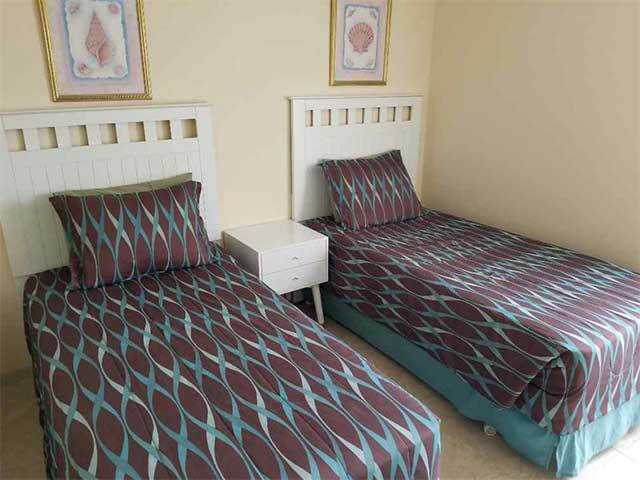 Rolling Hills is a quiet residential area, so you are assured of a peaceful night’s sleep. Entering through the front door, you step into a large, airy foyer, which leads into the dining area and the kitchen, and beyond is the lounge, overlooking the pool and lake at the rear of the villa. The kitchen is fully equipped, with a large fridge/freezer, cooking range and oven, microwave, dishwasher, coffee maker, kettle, toaster, mixer, blender and full sets of cutlery, crockery, utensils and housewares. The dining area next to the kitchen has a table which seats up to six, where you can enjoy a family meal. A washing machine and dryer, iron and ironing board are also provided – you’ll find all of these in the separate laundry room, located off the kitchen, and which also provides direct access to the villa’s integral 2-car garage. Relax in the lounge, with its high cathedral ceiling, and a ceiling fan, which keeps the air circulating. One couch converts to a queen sleeper. 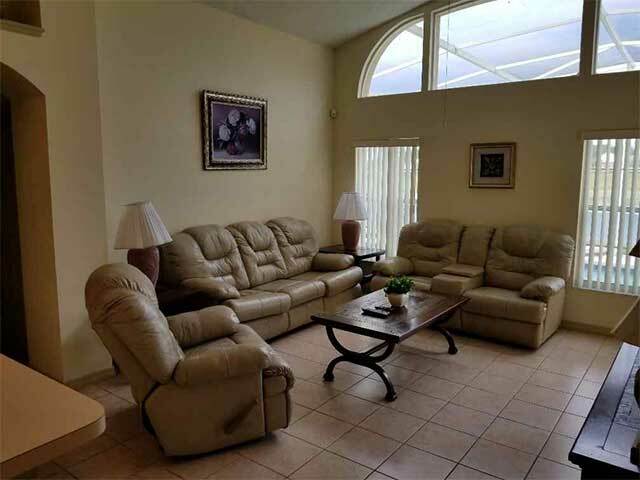 For your entertainment there is a large cable TV, CD/DVD player, VCR and stereo radio. A patio door provides direct access from the lounge to the deck and pool, and there is a great view through the two rear windows! The rear of the property faces west-south-west, and overlooks a beautiful natural lake, which is home to many birds and other wildlife, and across which you can watch the sunset at the end of the day. A patio door provides direct access from the lounge to the deck and pool, and there is a great view through the two rear windows! The rear of the property faces west-south-west, and overlooks a beautiful natural lake, which is home to many birds and other wildlife, and across which you can watch the sunset at the end of the day. Pool and Spa The screened pool area has the sun from before 11am until sunset, so you can enjoy direct sun for most of the day. Pool furniture on the deck includes table, loungers and chairs. Both patio doors leading out to the pool are fitted with safety alarms to prevent children from entering the pool area un-noticed. The spa and pool can be heated if required, and are equipped with an underwater light, providing illumination for your use in the evening. After a tiring day at the theme parks, relax in the spa, dine on the patio, and enjoy the wonderful lake view! 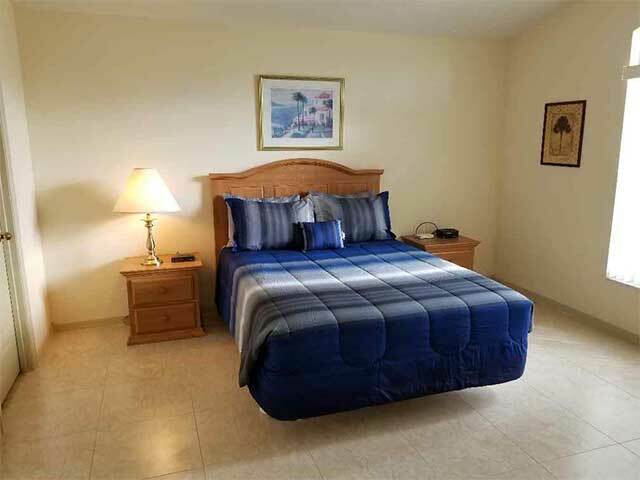 The first of the two master bedroom suites is situated directly off the villa’s lounge, and is equipped with a king-sized bed (with a medium-firm pillow-top mattress), cable TV, DVD player, radio alarm clock, a large walk-in closet, and a ceiling fan. There is an electronic safe, where you can store your money, valuables and documents securely. This master has a large en-suite bathroom with a garden bath, separate walk-in shower, toilet and twin sinks. An alarmed patio door offers direct access from this bedroom to the pool and spa area. The second master bedroom suite is located off the entrance foyer at the front of the villa. It is equipped with a queen-sized bed (with a firm mattress), cable TV and DVD player, radio alarm clock, and a ceiling fan. Like the other master suite, it too has its own en-suite bathroom, which includes a garden bath with integral shower, toilet, a single basin sink, and plenty of hanging and storage space. Bedrooms 3 & 4 are situated off the lounge, and each room features comfortable twin beds, a ceiling fan, a radio alarm clock, wardrobe and storage space. 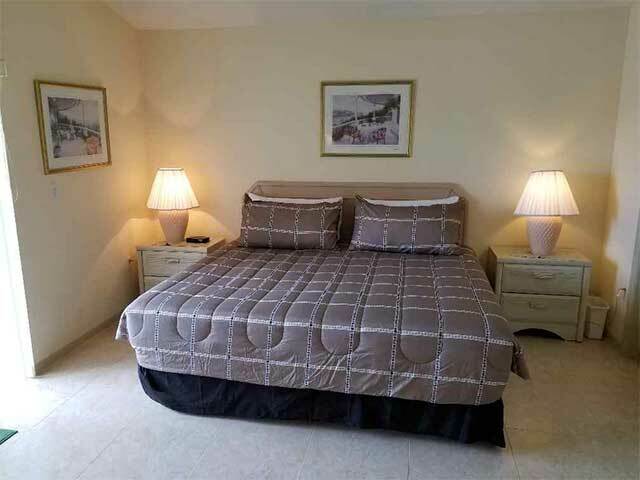 These two bedrooms share a full bathroom, which is located directly between the two rooms, with a bath including shower, toilet and single basin sink. For the safety of our guests, the villa is equipped with smoke alarms, a fire extinguisher, and emergency lighting. 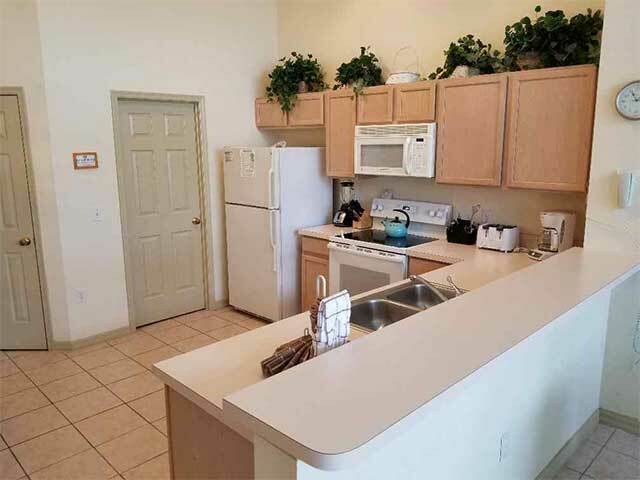 It is inspected annually, and fully complies with Florida State lodging safety regulations. © Copyright - Lakeside Orlando Villa - This website is in no way affiliated with or endorsed by the Walt Disney Company. All trademarks are the property of their respective owners.